Your Angler probably already has a lucky tackle box, but what about a custom label with name and phone number? Labels come in many materials--wood, metal, vinyl. Find something your angler will be proud of. You may want to also include a label with emergency contact information. This also works on a new tackle box. Don't be shy! Add fishing line as the gift bow. We recommend bright colored line for anglers who are a bit far-sighted, or who prefer to gaze at the beautiful lake and scenery, instead of squint at the line! Give your angler a variety of line types in different colors. Trolling motors are a smart idea for fishing on Rainy Lake. They allow for safer travel around islands and close to shore, and they act as a necessary back-up should your angler get lost on the 227,604 acres of waters! Holding your boat’s position on top of a piece of structure. If your angler has ever gotten up at the crack of dawn (or before it) to go out on a fishing adventure – only to come home hours and hours later without having had even a single bite – then you know the kind of desperation that some fishermen have when it comes to their favorite pastime. But, thanks to increases in modern technology, you’ll never have to worry about this happening again. Using the proper depth finder technology can give you the kind of almost unfair advantage you’ve been looking for when it comes to locating fish, catching them, and then deciding whether or not to release or cook them up. HOW TO GIFT: Either stash it in the garage and casually ask your angler to retrieve something you forgot. Let him find it on accident! Or grab a big box. Use one of the recommended smaller gifts as the gift box. Whether you're practicing Catch and Release or you are trying not to Kill your Limit, having a reliable hook remover is a must for the angler in your life. There are a couple different styles of hook remover but a nice pair of Angler Forceps or long needle nose pliers can get the hook out quickly and efficiently and are always an appreciated gift. HOW TO GIFT: Top a larger gift with this helpful tool. Or tuck this away in a pocket of a new Life Jacket! Things can get pretty messy on the water. 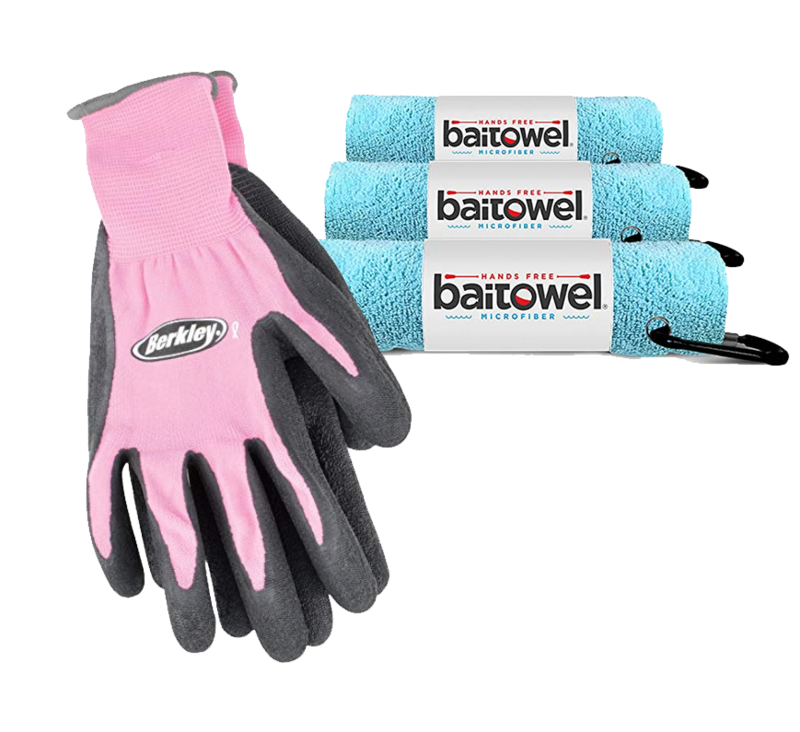 A Fishing Towel is a thoughtful and handy tool to bring along. A proper Fishing Towel removes blood, slime, bait and more from your fishing space. In addition, it can be used to help you get a good grip on what you just pulled in. Speaking of Getting a Grip there are many quality Fishing Gloves out there in all price ranges. A pair of these will help your favorite angler hang on to dinner and come home without bait under their finger nails!! A gift that keeps on giving, a Lifetime Fishing License can be obtained for Residents and Non-Residents alike. Whether you're inspiring a life of fishing in your child or giving Pops a pep in his step, this is one of those gifts that they'll never forget. Price varies based on the age and residency of the angler. The process takes about 3 weeks. Start the process now so it can be used on the next fishing adventure! When it comes to inspiring an angler, using a fishing guide may be the best way to do it. You ride along with the pros that know the fish, the river, what to use, and how to catch whatever you are looking for. If you want to give the gift of a sure thing, look to the guides whose job it is to make sure you have a successful and fun trip. HOW TO GIFT: Contact one of many fishing guides in the Rainy Lake area to secure a slot. Be sure to ask about Spring and Fall fishing options. Use our Display Certificate for a quick and easy printable gift. For extra fun, put the certificate in an envelope. Attach the envelope to a hook and line. Pull hard on the line when your angler reaches for the envelope! If your angler does a lot of fishing, a nice hat that keeps the sun at bay and a jacket suitable for multiple seasons will be a helpful part of the wardrobe. 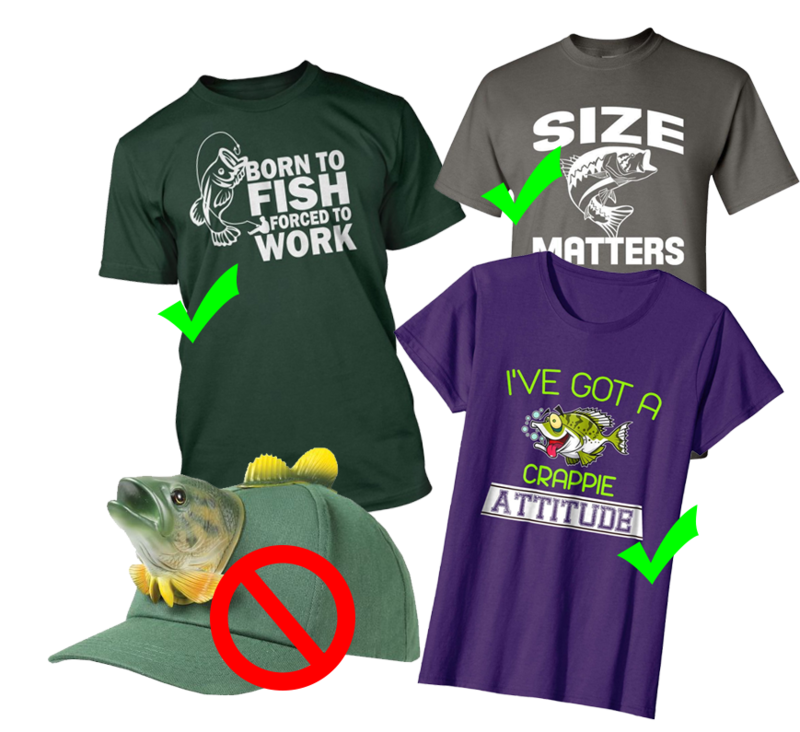 If your angler spends more time thinking about fishing than getting on the water--try a hoodie or tshirt that will at least demonstrate a proud dedication to the sport of fishing. Avoid apparel that will get your angler thrown off the boat. Many anglers love the simplicity of fishing so much that they might neglect to bring some of the essentials onto the boat with them. We like seeing our anglers prepared and safe! Look for a Fishing Survival Kit or basic First Aid/Survival Kit. On a budget? Hit the sales aisles or dollar store to create your own affordable kit for your angler. No reason to take a break from fishing when your life vest has ALL THESE POCKETS. Look for a vest that has a high back and doesn't interfere with the seats on the boat (or kayak). Keep an eye on sizing. Universal sizes can allow for some flexibility, but they won't fit as snug as a specific size. Every brand runs a little differently in size and shape, so keep that receipt! We love a personal flotation device that has fleece-lined pockets! 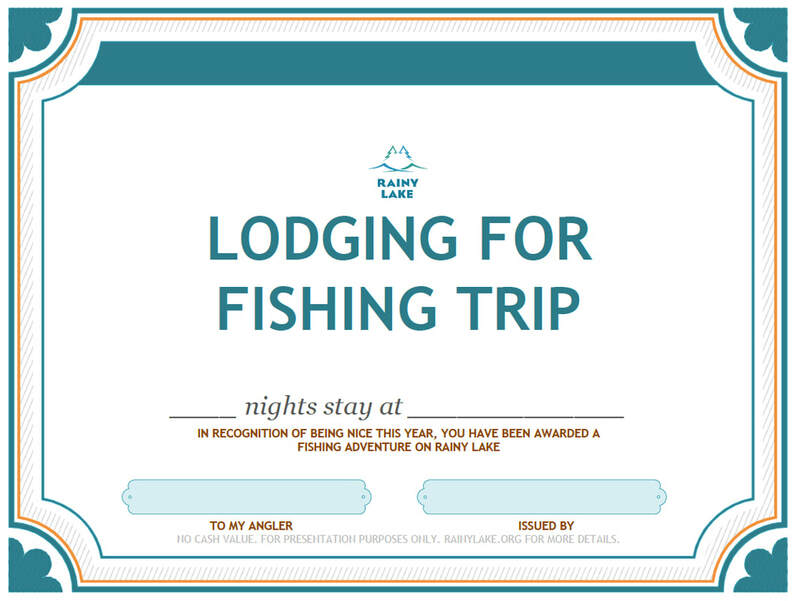 International Falls and the surrounding area offer an abundance of lodging options for anglers visiting Rainy Lake. This is one of those gifts that express that you really do love your angler and want to make sure the next fishing adventure isn't just a lofty dream! HOW TO GIFT LODGING: Browse our lodging options, contact the lodges that appeal to you, pre-book or request a gift certificate. Remember--pricing will vary throughout the year. Use our Display Certificate to ensure the gift can be shared on Christmas Day! We recommend wrapping the certificate in the largest box you can find! 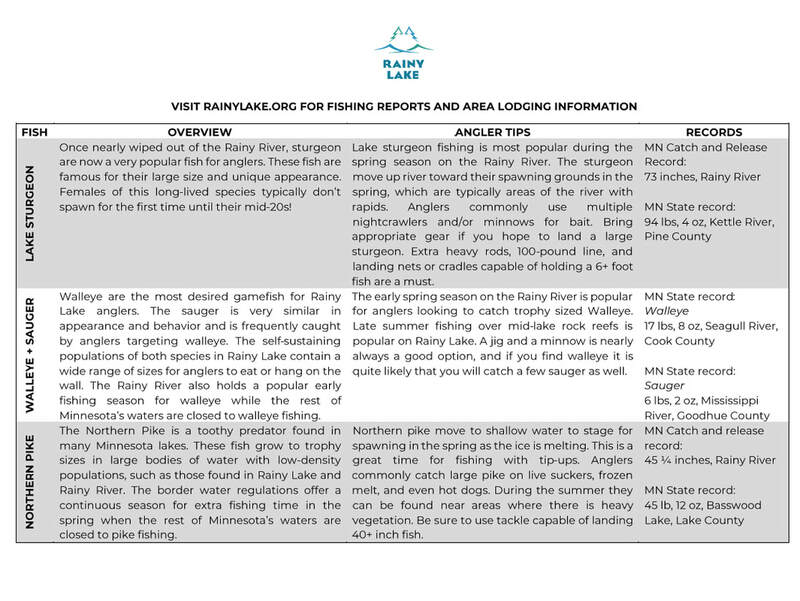 We interviewed some of the most experienced anglers in the Rainy Lake area to compile this information about the top fish to find on Rainy Lake and Rainy River. How to Gift it: Print double-sided on card stock paper. Have the page laminated or insert into a clear, protective folder. Include a fine tip marker, so your angler can fill out the top catches of the next adventure. Now that you have the perfect gift ready to go, we thought you might want to finish it off with a Rainy Lake exclusive fishing-themed Christmas card. Print the Christmas Card on white, yellow or light blue paper. Fold and trim as needed. Be sure to add a personal note about the many big fish you're hoping your angler catches next season! Fishing is the gift that keeps on giving!